Bulgaria's National Ethnographic Museum in Sofia is hosting an exhibition of the traditional Bulgarian good health charm "martenitsa". 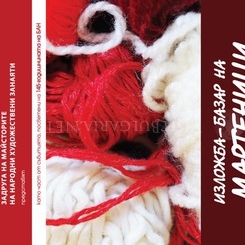 It features the works of the Cooperative of Folk Crafts Masters and shows traditional martenitsas from various parts of Bulgaria and own unique models of the masters. During the exhibition, which will continue through March 8, there will be workshops where the handier visitors could make their own martenitsas. There will also be a martenitsa market where the visitors can buy the red-and-white charms, traditionally given to family and friends on March 1.